SUMMARY: A victim of partial amnesia, 17-year old Cadence Sinclair recalls the story of her family, her three cousins, and the boy she loves. IF THIS BOOK WERE FOOD, IT WOULD BE: Grapefruit. It looks juicy and sweet, but it tastes bitter and is difficult to finish. WHAT I LIKED: E. Lockhart is a talented writer. 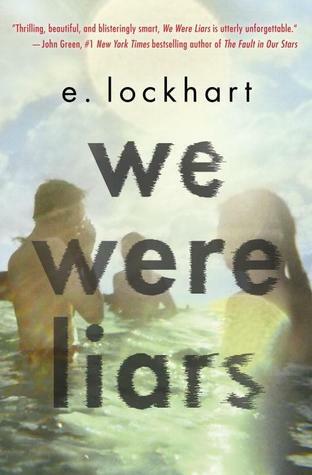 We Were Liars unravels slowly, revealing some shocking surprises in its own time. And yes, I was shocked. The poetic way Cadence tells her story will appeal to many readers. I love the occasional fairy tale allegories that reflect Cadence's dysfunctional family. WHAT I DIDN'T LIKE: Boorrriinnngggg. I would not have even bothered to finish this book if I weren't looking so forward to the surprise ending I kept hearing about. And yes, I loved the ending. Was it worth the 200 pages of a dull, privileged teen girl sighing and popping painkillers? I did love the ending, so I guess it probably was worth it. But be forewarned--nothing much happens until maybe the last 25 pages. I did not care for any of the characters. Not a connection, anywhere. THE BOTTOM LINE: Not much happens until the very end, but with beautiful writing and a slam-dunk ending, it's definitely worth reading. STATUS IN MY LIBRARY: Lots of F-bombs, so I don't plan to get it.